On Comex GOLD PRICE shot up $22.20 or 2% to $1,153.80. Lo, I will have more to say about THAT in a moment. SILVER leapt 34.5 cents to $15.125, over $15.00 at last. I told y’all I wasn’t worried about either one of ’em the other day, when they fell so low, bless their little hearts. Go look at the chart on the right and pay no attention to anything but one: the GOLD PRICE poking its head over that red downtrend line from last January, then also closing out there. And closing above that internal support-resistance line. All indicators point up, but gold must still conquer $1,170. It needs to rise further and longer. Now look at silver’s chart on the left. Just look at that one thing: silver closed above the downtrend line from the April 2013 high. And another thing, above the $14.95-ish top of its July – August range. Okay, $15.00 was the first hurdle, but now that August high at $15.72 become the next. This is all the more encouraging because the 200 day moving average floats less than a dollar above silver. It can easily leap that in two or three days. Today Mario “Would-You-Buy-A-Used-Car-From-This-Man” Draghi, head criminal at the European Central Bank, stated that the ECB need more time before deciding on additional stimulus measures, i.e., more quantitative easing. I reckon that put downward pressure on the buck (“We’re going to depreciate the euro more slowly”), and gold took a big $20 jump. 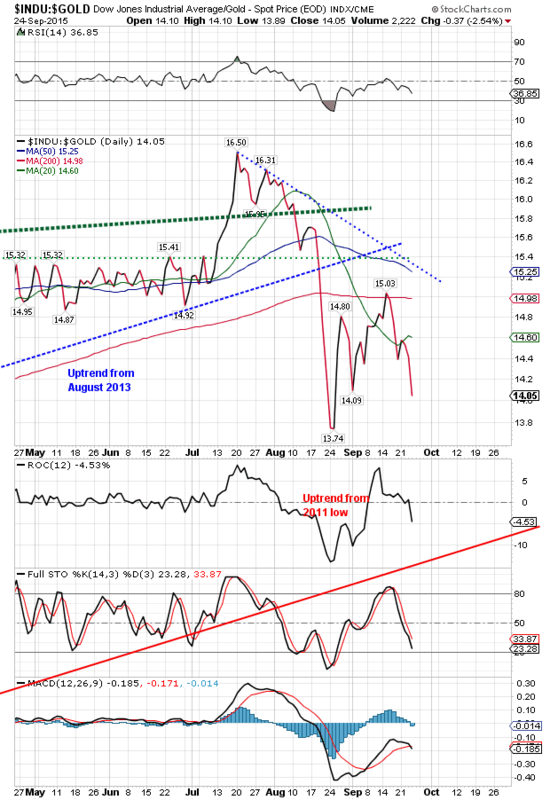 US Dollar index sank to a 95.57 low, but later recovered much of that. Stocks behaved like the dollar, with a big fall and later lame recovery. Yeah, Buddy! Ain’t nothing like central banks to stabilize markets. As if one criminal flapping his lips weren’t enough, Comrade Janet Yellen, head criminal at the US Federal Reserve, tried to resuscitate the Fed’s dying credibility by speechifying that the Fed might raise rates later in the year. I reckon this is how mountainous Our Masters’ contempt for us really is. They make empty boasts and claims, are exposed as fools and cowards by their acts, then slink back onstage as if nothing had happened to see if we will buy the same lie twice. What this country needs is to revive the salutary custom of Tarring and Feathering and Riding Out of Town on a Rail. Make that hot tar, and buzzard feathers –nasty buzzard feathers. Dow traded as low as 16,016, down 263, but climbed from about 1:30 to recover about 190 points of that and end the day down “only” 78.57 (0.48%) at 16,201.32. S&P lost 6.52 (0.48%) to end at 1,923.24. That recovery may be hinting at a higher day tomorrow. Maybe. Yet the trend is firmly down and the main chance is lower stocks tomorrow..
Dow in Gold, Old Reliable, sank 2.54% today to 14.05. I want y’all to look at the chart, so you can see how far below its 200 and even 20 day moving averages it stands. AND the Moving Average Convergence Divergence (MACD) indicator has turned down again. DiG long ago (August) fell through the uptrend line from August 2013, and now is zeroing in on the uptrend line from the 2011 low. Another big fall is coming that should pull it below the 13.74 August low. 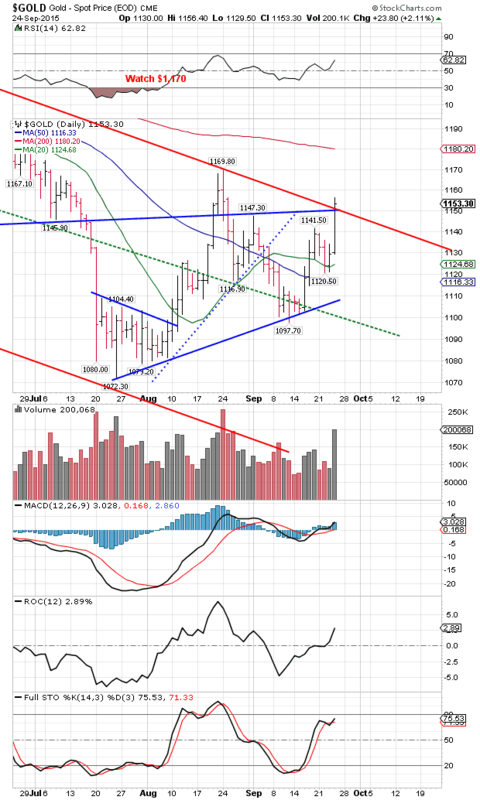 Dow in silver chart, shows much the same picture, but is not quite as far along as the Dow in Gold. DiS stands below all its moving averages, including the 200. Dropped 2.85% today to close at 1,074.52. 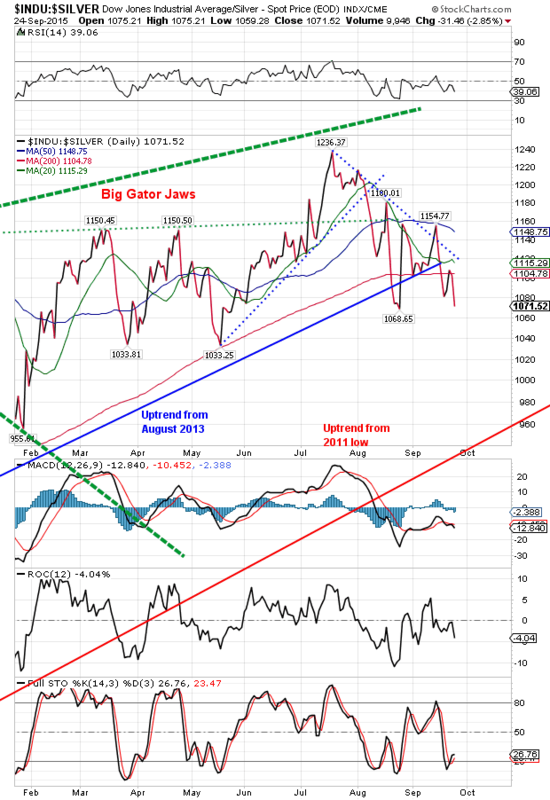 That’s near the 1,068.65 August low. Looks like Draghi’s remarks sent the Nice Government Men scrambling to salvage the US dollar index, which tanked 70 basis points but closed only 6 basis points below yesterday. Smells like the fish market down on Decatur in New Orleans. Might even rally tomorrow. Euro rose a nothing 0.1% to $1.1195. Y’all better take that European vacation while there are still some Europeans left. They’re gonna be rarer than spotted owls and snail darters pretty soon. May qualify for the Endangered Species List. Yen rose 0.02 to 83.18. 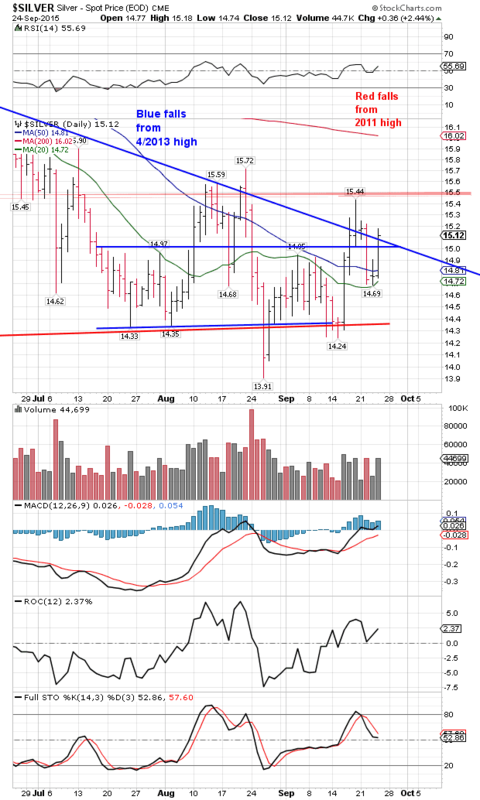 Chart has developed an even-sided triangle that is fixin’ to break out one way or t’other, and since it stands above the 20 DMA, my guess is upwards. Nice Government Men in Nippon will discountenance this. Gotta run — Susan’s waiting supper on me.